In a world of instant gratification and “must have now” culture, it’s easy to forget that sometimes, the longer things take the better. Given the opportunity to extend a good experience, wouldn’t you take that over having it done and dusted? This and a few other ideas have been occupying my thoughts in a varied and rather unusual/exceptional week in the Lakes. To date, all my visits here have been characterised by careful planning and a desire to optimise my walks so as to bag as many Wainwrights as possible in the time available. This time would be a bit different. I had six walking days and the first two would be used in revisiting some fells I’d already bagged. The reason for this madness was that I would be joined for those two days by my good friend and ex-colleague, Remco van Essen. Remco had never done any fellwalking before and I thought it best to select a couple of routes I was already familiar with so as to provide a good, manageable and varied introduction. Another academic year had come to an end with the annual award ceremony on the preceding Friday and on Sunday I’d driven up to mum’s in Southport. Bright and early on Monday morning, I set off to meet Remco at Oxenholme railway station, just south of Keswick. He’d got a very early train from Euston and at 9.30am we were driving into the heart of Lakeland. The weather in London over the past month or so had been exceedingly hot and dry, but today in the Lakes, it was cool, damp and misty – actually quite a relief. 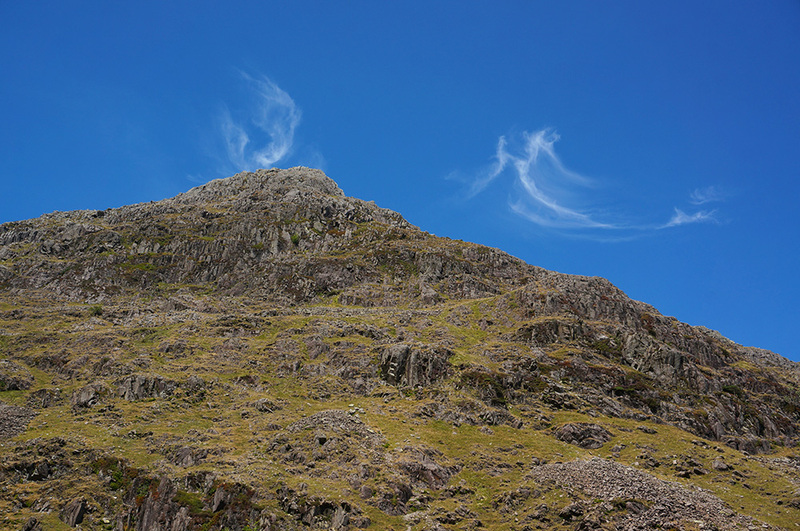 I decided that the Langdale Pikes might be a good choice, with the walk up to Stickle Tarn being a good test for a novice and providing the option to continue up to the tops if that proved too easy. We arrived at the Stickle Ghyll car park just after 10am and started to get our kit on. As we were doing so, another car drove up and parked next door. Two blokes got out and had a short conversation about all cars being grey these days. My car is grey and so was theirs. The only reason I was interested in this is because I thought I recognised one of the two blokes, he looked remarkably like the guidebook author, Mark Richards, who wrote the excellent Fellranger guides, but I wasn’t sure as I’d only seen a small author photo in a book. As they prepared for their walk, I heard his companion refer to him as “Mark” and I realised it must be him so I asked him if he was Mark Richards (he was) and I introduced myself, with the shake of a hand, as a big fan of his books. I’m not sure what I expected and at first Mark seemed a little thrown by being recognised at all, but he very quickly recovered and became animated, telling me what they were doing, his plans for a new series of books for Cicerone and a new podcast project he was just about to embark upon. We also exchanged views on the various merits of Mungrisdale Common. He explained his rationale for the new books, a complete reworking of the eight-volume fellranger guides by saying that the new books were designed for people rather than simply being an inventory of the fells, “after all”, he said, “it’s people that matter, the fells will always be there”. He is a lovely man and would obviously have talked more but I could see his companion thought they should be getting on, so I thanked him for his time and said I didn’t want to keep them from their walk. Well, what an amazing coincidence and what a fantastic start to the week. It’s not every day you get to meet one of your heroes. 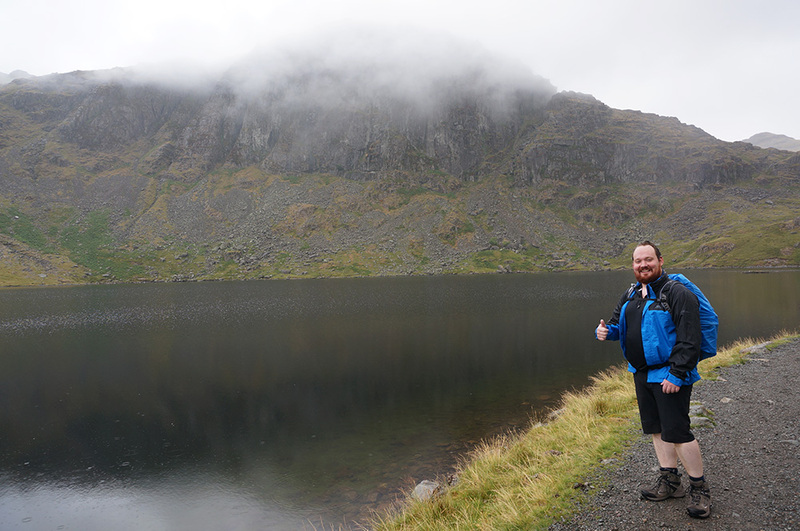 Remco at Stickle Tarn with Pavey Ark swathed in mist. After I’d finished lacing my boots and donning my rucksack, Remco and I headed off for the Dungeon Ghyll footpath. The route to Stickle Tarn is a long, steady climb but the path is very well pitched for most of the way and only really requires any scrambling towards the top. The slopes of Harrison Stickle in mist from the north-east shore of Stickle Tarn. It had already started raining by the time we reached the tarn and mist was rolling over the tops of Pavey Ark and Harrison Stickle. We had a descent break after the climb and we decided to continue the walk to take in the summit of Pavey Ark. We set off north, around the tarn in search of North Rake, a simple but steep scramble. There’s a point about half way up where the ground flattens into a small grassy plateau with a fantastic view down over Stickle Tarn. We took advantage of this for a short break and to take some photos when the tarn was intermittently revealed between banks of rolling mist. Remco mentioned something about not realising that fellwalking would mostly be rock climbing. 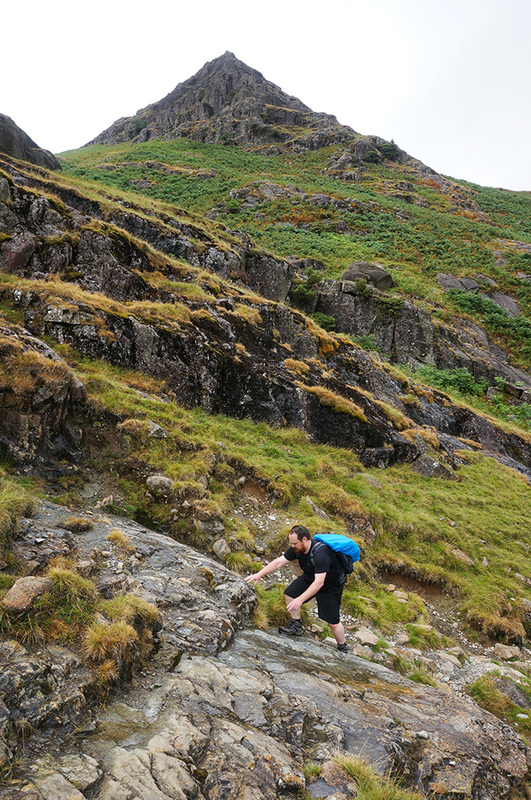 It is true that most walks to the higher (and sometimes lower) fells require the use of hands on rock and, for me, this has become some of the more entertaining aspects of this wonderful activity. Stickle Tarn from the look-out point on North Rake. 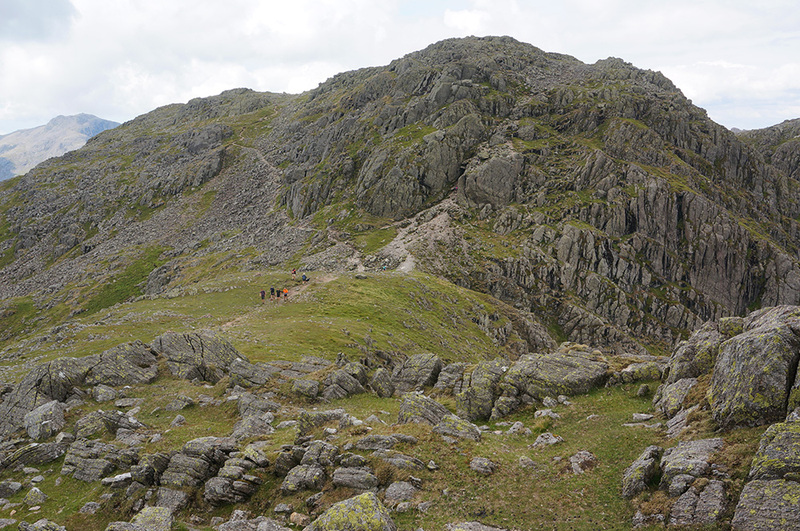 After a little more climbing, we reached the final plateau and were soon at the summit of Pavey Ark. Naturally, there was no view. We’d climbed into mist and there was nothing to be seen other than the rock we were standing on. Having reached our primary objective, it seemed sensible to proceed to the highest point of the Langdale Pikes, the summit of Harrison Stickle. So we set off south. I have to admit that I always find this area a little disorientating, especially in mist, but we managed to find our destination with only a minor correction of our route. Again there was no view from the top but reaching this point seemed like a triumph, especially since this was Remco’s first outing in the Lakes. It was still raining and we were both soaked. After a short break, we retraced our steps down from the summit along the Pavey Ark path and then diverted right on the descending path back to Stickle Tarn. We soon dropped below the mist and the world opened up again. 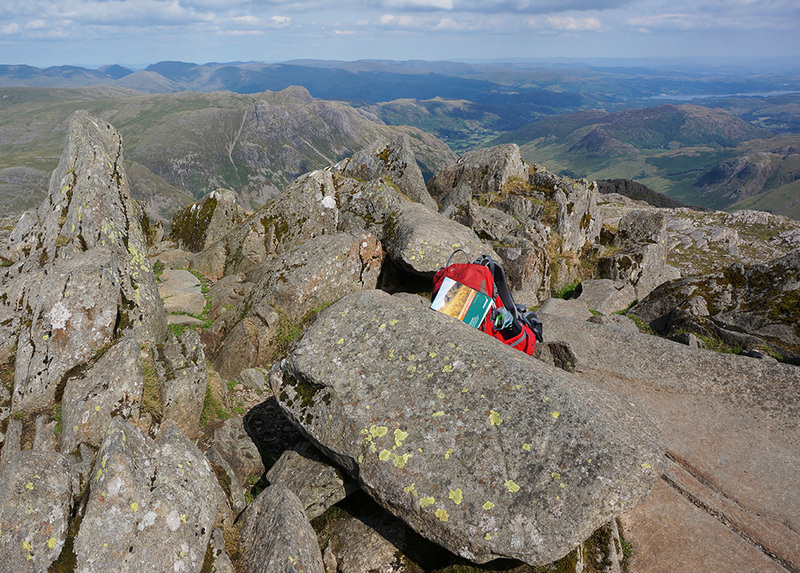 Remco reaches the summit of Harrison Stickle, the highest point in the Langdale Pikes. The descent back to the car park beside Dungeon Ghyll seemed longer than the climb and Remco was beginning to flag. However, we arrived back at the car without further incident (other than a few slips on wet rock) and I thought we’d judged the trip very well. After dumping our bags, we enjoyed a welcome pint of shandy at the Stickle Barn where we may have made the seat cushions a little damp. Later, we checked into the Elterwater hostel and had an excellent meal at the Britannia Inn. It looked like Tuesday was going to be a dry day. We’d left our wet boots and gear in the Elterwater hostel drying room over night and everything was pretty much dry by the morning. I thought a short-ish but pleasant walk would be the order of the day. Remco was a little sore after our exertions on Monday but he seemed keen to continue with the Lakeland experience. I decided we would do one of my favourite walks. Tarn Crag from Grasmere via Easedale Tarn and the very lovely Codale Tarn. Tarn Crag from Grasmere (11.5km and 689m or ascent). Start/end: Red Bank car park. We parked up at Red Bank Road car park in Grasmere and were soon on our way. Turning left opposite the Sam Read bookshop, we walked past YHA Grasmere and up to the Easedale footpath. One of the many nice things about this walk is that the approach includes a great view of Sourmilk Gill and the rising footpath ahead. In truth, the gill was a shadow of its former self; the weeks of dry weather meant that the cascades weren’t as spectacular as usual. After a gentle start, the path steepens, although it’s easier going than the Dungeon Ghyll path we’d taken the previous day. After a few expletives and a deal of sweat (from Remco) we arrived at Easedale Tarn where we found two lovely boulders for seats and sat at the water’s edge while we (he) recovered. Looking back to Easedale Tarn with Tarn Crag on the left from the rising path to Belles Knott. The next stage of the walk is easy and practically level. We walked along the southern shore of the tarn and out towards Belles Knott. It’s a lovely bit of landscape and there’s definitely a sense of moving from the known and into the unknown as very few “tourists” make it any further than the Easedale Tarn outlet. So people disappear and the landscape grows wilder. The approach to Belles Knott does appear quite intimidating. The rising path looks very tricky and Bells Knott itself towers over the intrepid fellwalker. In truth, it’s not as impossible as it appears but I had forgotten that the climb is technically quite difficult in places, with hands required for most of the time. This would be a good test for Remco. We took it slowly and after a few tricky but successful manoeuvres over slippery rock, we reached the top. Time for another break; that was the most difficult phase of the walk over. The approach to the formidable-looking Belles Knott. While we were admiring the view back over Easedale Tarn and to the hills beyond, we were joined by a German family who had walked from Langdale. They wanted to know if there was a pub near the tarn and we had to disappoint them, telling them that the nearest pub was in Grasmere. They told us they were from Bavaria where all lakes have a pub. Quite right, all lakes should have a pub! Remco climbing the slippery, bare rock path under Belles Knott. After our break, we continued around Belles Knott and into the beautiful basin of Codale Tarn. The last time I visited Codale Tarn, in October 2016, I was blown away by how beautiful it was and now, in July 2018, my opinion hadn’t changed. In fact, I think it’s probably the most beautiful place I’ve visited in the Lakes so far. Indeed, I am pretty sure that, when the time comes, this is where I want my ashes scattered. 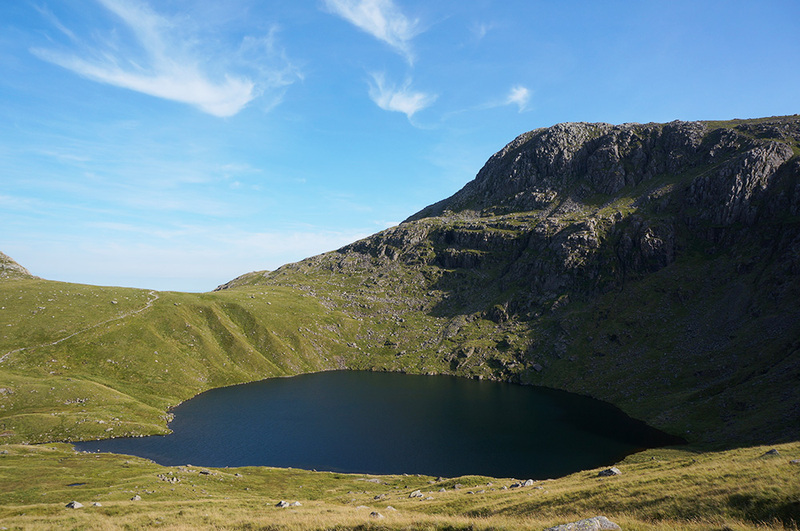 Wainwright’s ashes were scattered at Innominate Tarn on Haystacks and that’s a place I have yet to visit but, in my own opinion, it would have to be extra-special to beat Codale Tarn. Codale Tarn from the rising path to the Tarn Crag ridge. Remco and I sat and took in the scene, even though we’d recently rested at Belles Knott. This place is a little oasis of calm. There are no long views out and, in truth, it’s impossible to tell how high it is except for the memory of the climb. I could easily have spent an hour at Codale Tarn but, reluctantly, we pressed on, crossing the outlet stream and headed for higher ground. The weather was turning out to be ideal for walking; bright with some cloud cover and occasional breaks of sunshine. Not too hot and certainly not cold. We followed the faint, rising path with the old sheep fold on our left and soon made it to the ridge where we turned right towards Tarn Crag. Tarn Crag summit and cairn from the viewpoint over Easedale Tarn. The ridge route itself is a little complicated and as Tarn Crag is not one of the popular tops, the path is faint and intermittent. However, after only one false turn, we arrived at Tarn Crag summit; Remco’s third Wainwright. The weather couldn’t have been more different from the day before, when there were no views out. Today, there was a glorious view south-east to Silver How, Loughrigg Fell and Lake Windermere, a fitting reward for the effort. After patting the summit cairn, we crossed the dip and visited the forward viewpoint cairn. From this location it’s possible to look down onto Easedale Tarn and get a good sense of the height gained. The viewpoint cairn itself was looking quite different from my previous visit, when it formed a slender column of carefully placed stones. Today it was just a pile. The column had either succumbed to the weather or been knocked down by human visitors – I hope it was the former. 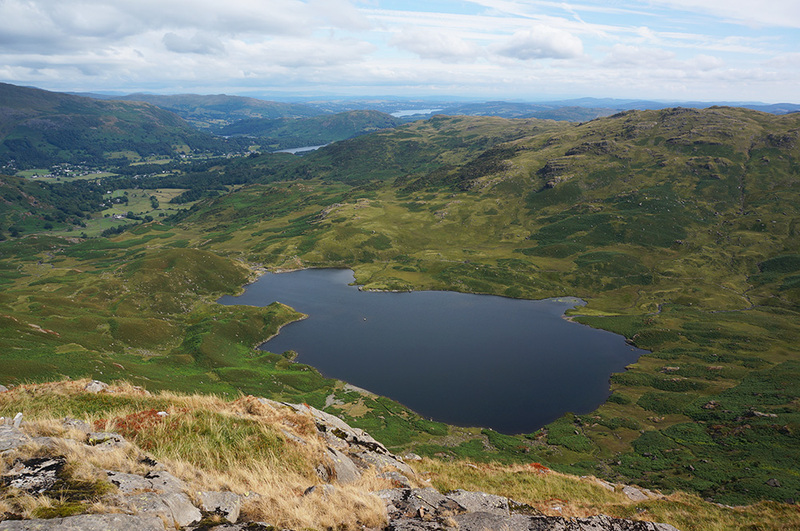 The view down over Easedale Tarn and beyond to Windermere from the Tarn Crag viewpoint. After another break, we set off due east along the ridge, knowing that it was downhill all the way back to the car. The return leg of this walk always seems longer than it should be but I think that’s because the outward leg is so full of interest. The return leg is not boring but it is a bit of a tramp, with every step taking you further away from the place where you’d rather be spending more time. Remco had a train to catch and a visit to my favourite fish and chip shop to fit in, so we couldn’t linger. 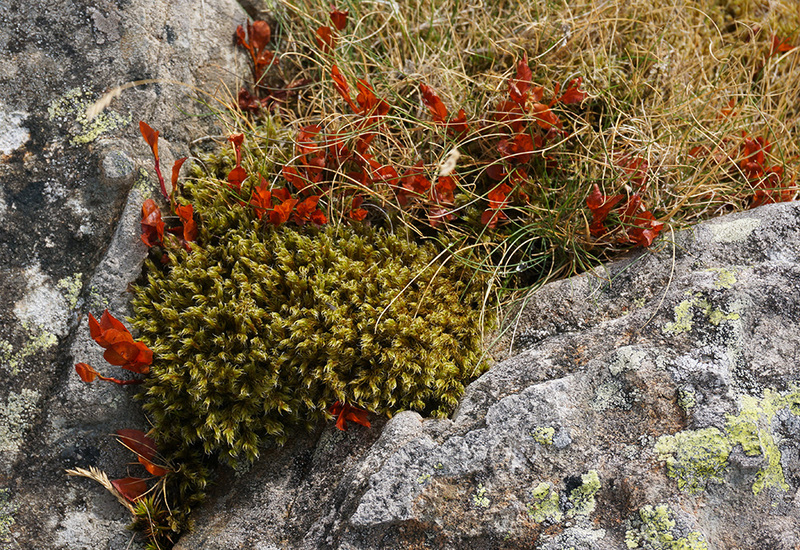 Landscape detail at Tarn Crag. After just a few trips and stumbles, we arrived back at Grasmere, Remco looking rather relieved. Although it hadn’t been as strenuous as the previous day, it was a longer walk. We decided we should make the post-walk shandy a tradition, so we stopped at Tweedies Bar & Lodge, got our drinks and sat outside – bliss. We drove to Ambleside, parked up in the main car park and went straight to the Walnut Fish Bar, where we ordered two fish and chips to eat in. Sadly, we were a little behind schedule, so we couldn’t savour our food but I enjoyed it nonetheless. Shortly after, we were on our way to Oxenholme railway station. We arrived in good time, only to discover that the train was delayed by twenty minutes. What a shame, we could have spent an extra twenty minutes with that lovely fish! With Remco safely back in London, it was time for me to crack on with bagging Wainwrights. I decided to take on one of the big walks I’d planned more than a year ago, the Head of Langdale, 6 Wainwrights, 18km and over 1,500m of ascent. In fact, I had begun this walk on 3rd August last year but when I got to the top of Pike o’Blisco, a thick mist had descended and I decided not to risk the rest of the walk. Today, the weather was clear and I knew there’d be no problems with navigation. The only thing I’d have to battle was the heat. I loaded up with as much fluid as I thought would be sensible and set off from the Old Dungeon Ghyll car park. The Redacre Gill footpath is very steep, and although it is expertly pitched, the heat of the morning meant I was already sweating profusely by the time I was half-way up. The early part of any fell walk is always the toughest; I guess it’s one of the things that puts a lot of people off. 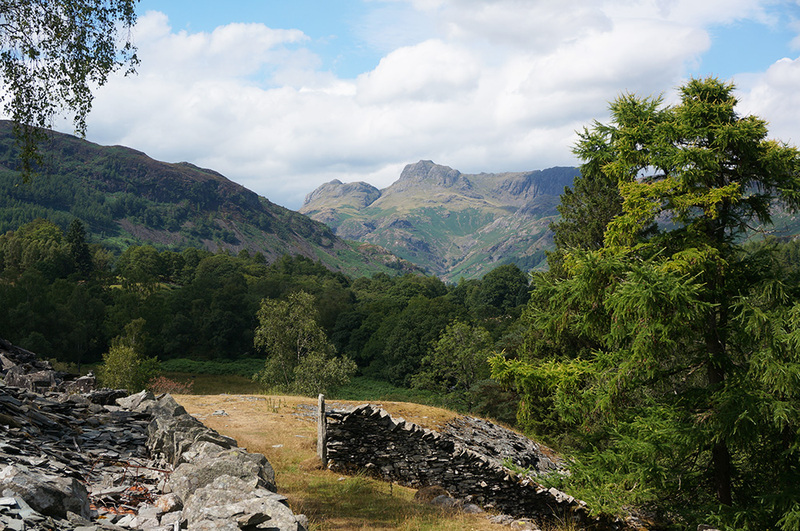 The Langdale Pikes from the Redacre Gill footpath. With plenty of pauses to catch breath and take on water, I made it to the top of the pitched section about an hour after leaving the car. From that point on, the route to Pike o’Blisco is less steep but a little rough-going with an easy but notable scramble en route to the summit. The view from the top could not have been more different from my last visit. The air was very clear and although there was now a little cloud bubbling up, the day was fine and hot. There were fantastic views across to the Langdale Pikes and I could see most of the planned route, over Cold Fell, Crinkle Crags and Bowfell. 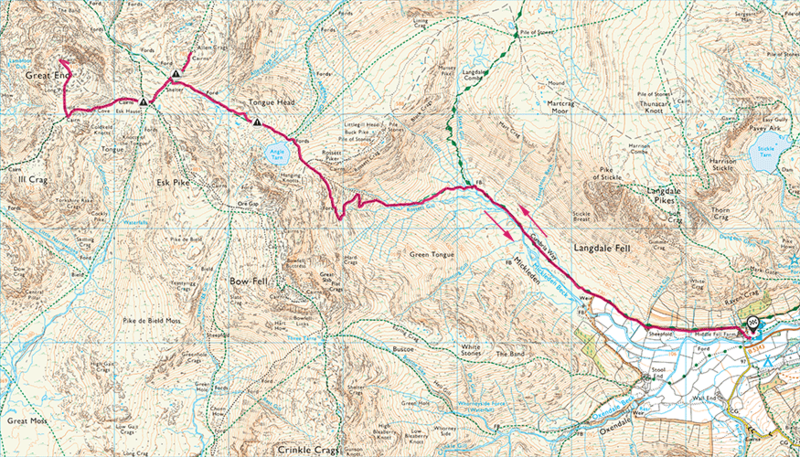 The Head of Langdale walk (18km and 1560m of ascent. Start/end: Old Dungeon Ghyll car park. After a short break, I headed down to Red Tarn, losing 200m in height and knowing I’d have to gain it back on the rise to Cold Pike. From Red Tarn, the route to Crinkle Crags is clear but there’s no obvious path to Cold Pike (or at least I couldn’t find one), it being less frequently visited. So I struck off the rising path and made my way over open fell in the direction of Cold Pike summit. When I arrived, the summit was already occupied by a very nice chap who told me he had recently retired and was slowly working his way through the Wainwrights in an effort to keep himself fit. We exchanged a few stories about our walks, I took my (by now) obligatory photo of the summit cairn and went on my way, back to the main Crinkle Crags footpath and leaving my interlocutor to contemplate the scene. The view down into Oxendale from Crinkle Crags. Mercifully, cloud had thickened and by now the temperature was feeling much more comfortable. At the base of the first crinkle, I stopped for lunch. I considered extending the walk to take in Little Stand, a Fellranger fell and a 2km there-and-back walk from my current position, but decided that this walk was already challenging enough for me. After the break I climbed up to Crinkle Crags and was soon approaching the bad step at the base of Long Top. I watched a few supple, young people negotiate the simple rock climb and decided to take the easy way out by walking the longer left-hand route. In my defence, Wainwright notes that “The Bad Step is the most difficult obstacle met on any of the regular walkers’ paths in Lakeland”. Maybe at some future time, in the company of a supportive companion, I’d have a go. The climb to the highest crinkle at Long Top with the “bad step” on the right. This section of the route is quite popular with people arriving from Langdale via The Band, so there were plenty of people around as I reached the summit of the second and highest crinkle, known as “Long Top”. After that, the third, fourth and fifth crinkles come in quick succession, each with great views down into Langdale and ahead to Bow Fell. 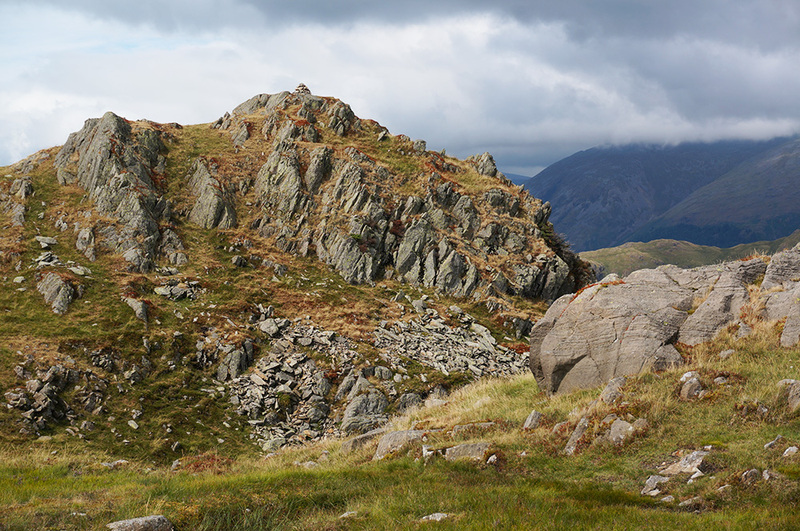 The route over Crinkle Crags and towards Bow Fell is rocky with lots of loose boulders and the unusual profile of Bowfell gives the place a very Tolkienesque atmosphere. One can certainly imagine the place being used as a film location. The facing slopes of Bowfell are riven with gulleys and skirted with scree. The whole mass reminds me of some huge marine fossil, perhaps a Trilobite of massive proportion. Bowfell with the Scafells beyond from Shelter Crags. The approach to Bowfell is rocky but relatively easy save for the steep pull just below the summit. The summit itself forms a small rock cockpit with no cairn. In truth, there isn’t really room for one. Despite this, there is no ambiguity about this top, it’s clearly the highest point around. Interestingly, although there is no trig pillar here, there is an OS benchmark arrow carved into one of the summit rocks. Looking back to Crinkle Crags and Pike o’Blisco with the Coniston fells in the distance from the rising path to Bowfell summit. As this is the highest point on the walk, I took a moment to consider the views, which are extensive, and then made my way down and towards Esk Pike. The Ordnance Survey arrow carved into rock at the summit of Bowfell. 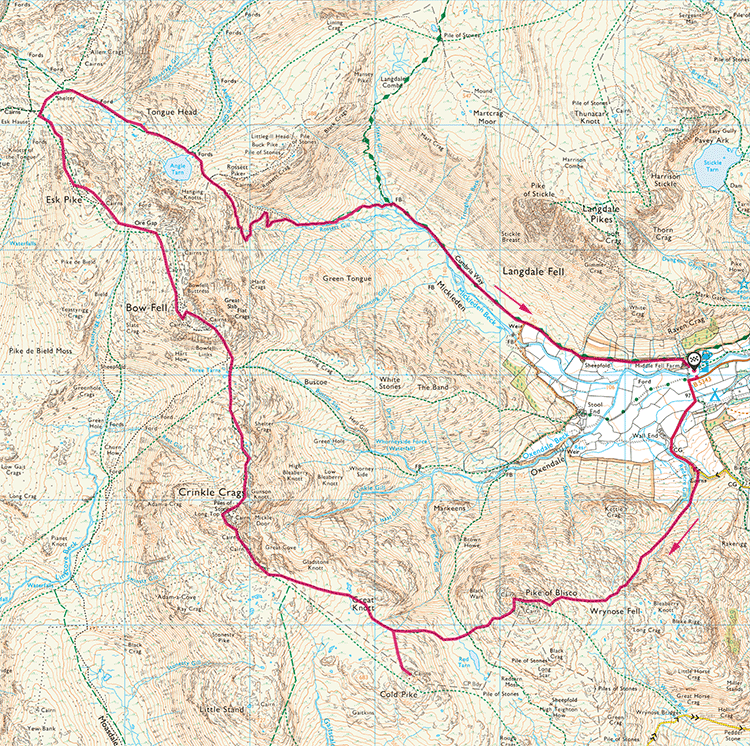 The route from Bowfell to Esk Pike turned out to be the trickiest part of the walk. Although it’s a route often used, much of it is over exposed rock or through boulder fields, so no obvious path exists. Fortunately, much of the route down into Ore Gap is waymarked with cairns, for which I was very grateful. 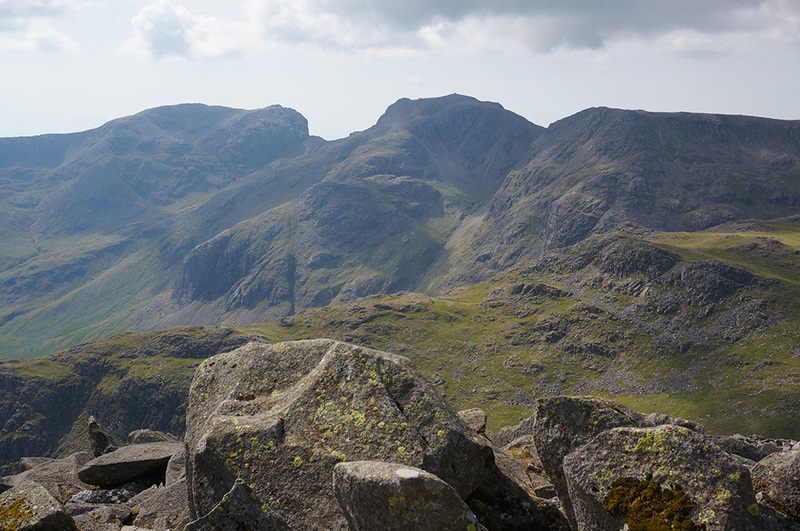 Scafell and Scafell Pike with the Mikledore gap between them from Bowfell summit. 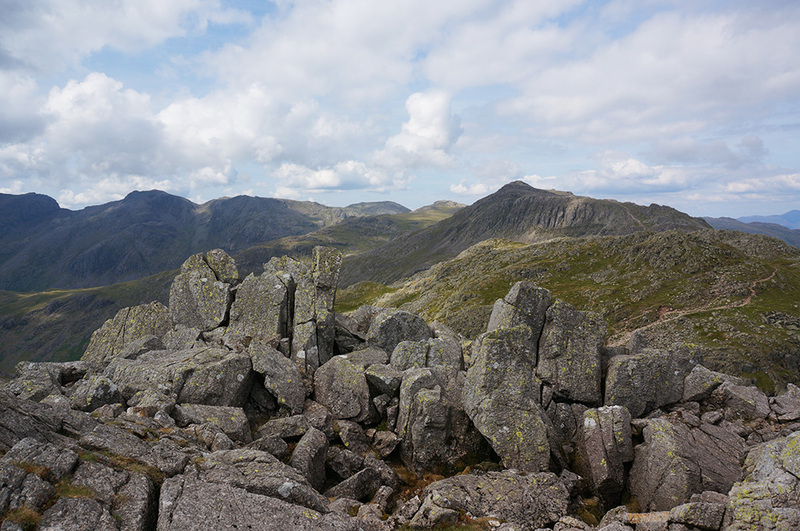 Esk Pike is a rocky buttress of a fell and the summit rock is colourful, splintered and fissured vertically. Once again, there’s no cairn here but the top is not in dispute. From Esk Pike I dropped down to Esk Hause and followed the path round and down to Angle Tarn, a really beautiful body of water. By now, the cloud had cleared and the sun was again beating down and despite the fact that it was now 5.30pm, the day was still hot. I’d been rationing my water intake so as to spread it out during the walk but the truth was, two litres just wasn’t enough in this sort of weather. 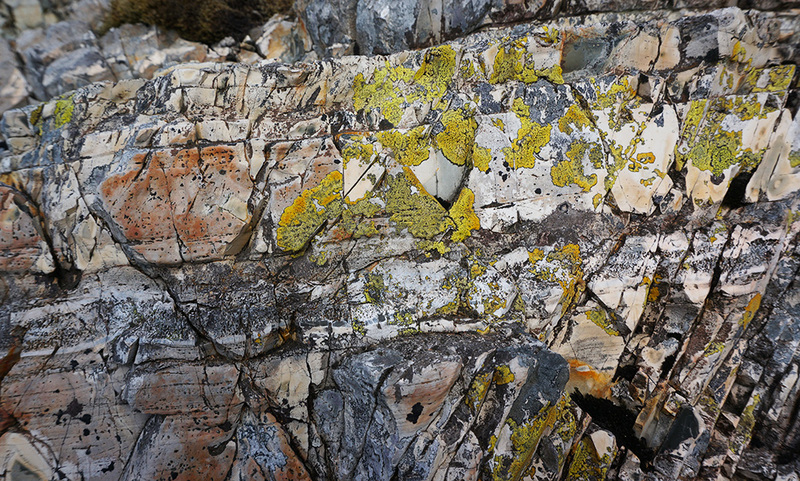 Highly coloured rock near the summit of Esk Pike. After a short break at the tarn, I made the steep climb south-east and was soon at the summit of Rossett Pike, the sixth and final Wainwright of the day. It was a lovely, clear evening and the views down into Langdale were stunning. 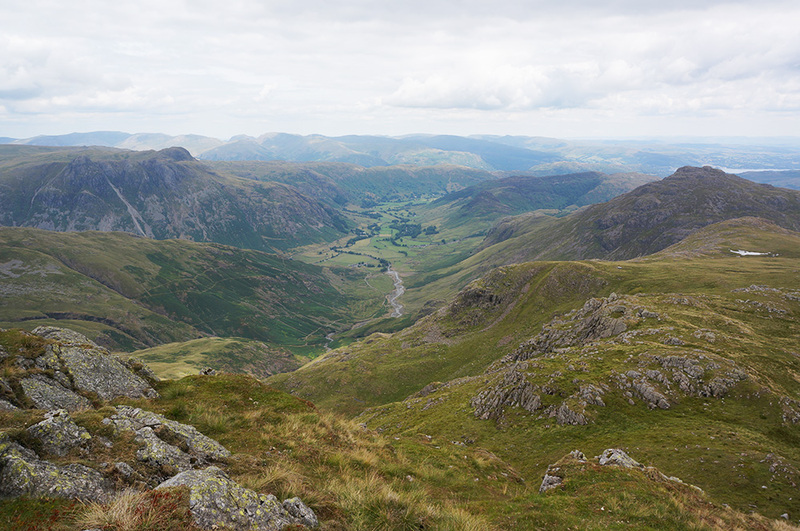 From Rossett Pike, I had planned to walk to Black Crags and find the path down to the Stake Pass route along the Cumbria Way. I got to Black Crags with no problem but try as I might, I couldn’t find the descending route and the terrain looked way too dangerous. I did find the path up to Stake Pass itself but that would have significantly lengthened the walk and I was already feeling a little weary. So I retraced my steps, arriving back at Rossett Pike and descended via Rossett Gill. Angle Tarn in the late afternoon sun with Esk Pike above. The Rossett Gill path is a long rocky switchback but it is clear and the route is obvious. As I descended, all Mickleden was filled with the call of shepherds, bringing their flocks down from the fells. Down below I could see the sweeping runs of sheepdogs and the flow of hundreds of sheep. The view down into Mickleden from Rossett Pike summit with Pike o’Stickle and Loft Crag on the left. From the bottom of the Rossett Gill path, it’s still almost 3km back to the car park and although the valley was now in cool shade, I was feeling a little dehydrated and more than a little weary. I arrived back at the car at 8.30pm. I’d been out for 11 hours. By rights, Thursday should have been a rest day. 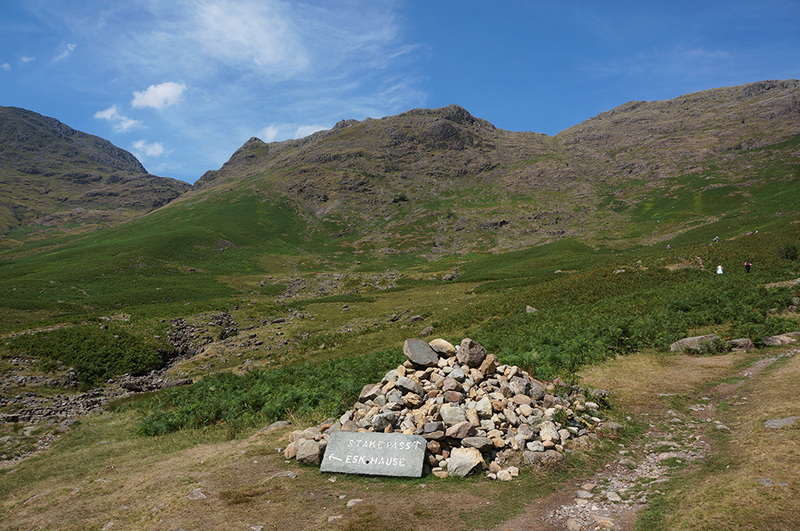 I’d over-extended myself on the Head of Langdale walk, it being so hot. But it seemed criminal to waste a perfectly good day when commonly, the weather in the Lakes is so “unpredictable”. So I decided to take things easy today and not set a definite goal. 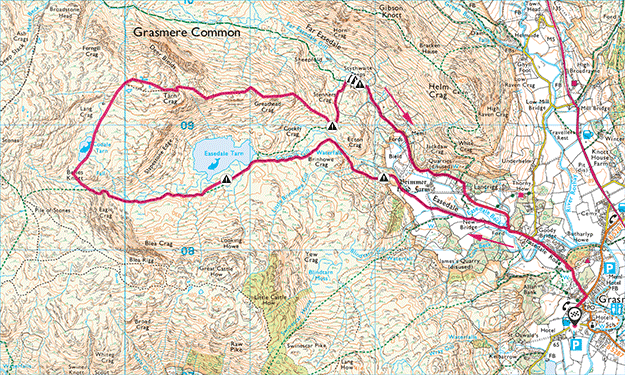 I would do a simple, out and back walk from Old Dungeon Ghyll, heading in the direction of Great End and taking in Allen Crags along the way. I told myself that it didn’t matter if I didn’t make it since both these tops would be included in a future walk – no pressure. I made a late, lazy start at 11am. 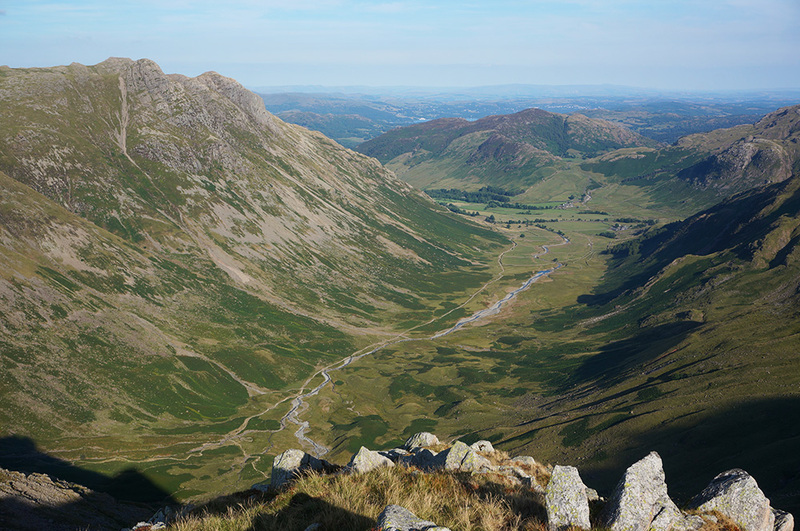 The day was just as hot as Wednesday had been so I drank a deal of water before starting out and took as much as I could easily carry then set off, back the way I’d come the previous day, headed for the Rossett Gill path. The junction cairn at the head of Mickleden where the Rossett Gill path forks left to Esk Hause and the Stake Pass path forks right. Both rise steeply from this point on. That morning, at breakfast, I’d sat opposite a young American academic who was over for a conference and had decided to visit the Lakes for some walking. It turned out he was planning the exact same walk I’d done the previous day so he asked for some clarification on route details. I gave him what advice I could and cautioned him that it was quite a tough route, especially in the heat. On reaching the large cairn at the foot of the climb, I toyed with the idea of taking the Stake Pass route instead but, having come down Rossett Gill, I was interested to know how it would feel to go up, so that’s what I did. Redacre Gill is a treat compared to this. It’s steep, it twists and it turns. There are a few sections where it levels out a little but for the most part, it’s a hard slog. I didn’t mind this because I wasn’t in a hurry and the whole of the Langdale valley was filled with sunshine, giving some fabulous views to the Langdale Pikes and beyond. Looking up to Rossett Pike from the Rossett Gill footpath. 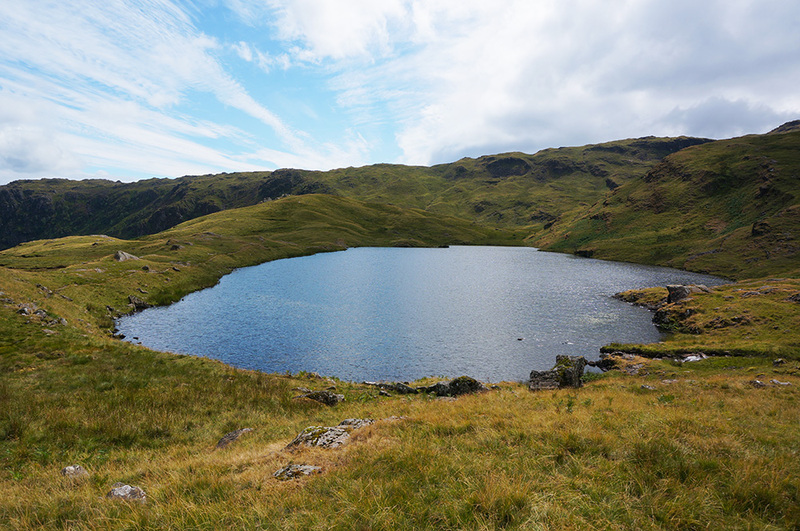 I arrived at Angle Tarn in time for a late lunch stop at 2pm. I sat down by the water and ate my customary apple and muesli bar. Casting my eye over those lunching at the tarn, I noticed someone I thought I recognised. Slightly taken aback, I walked over and said hello to my American breakfast companion. I told him he’d done really well to get this far in such a short time. 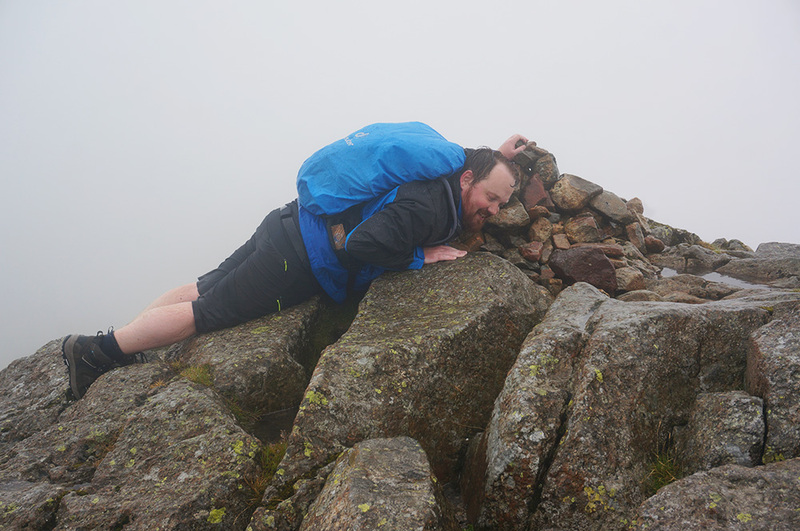 He told me he found the Redacre path to be a pretty tough climb and the boulder field between Bowfell and Esk Pike to be a bit tricky but apart from that, he’d had no problems. I told him, well done, and left him to his book and his sun basking. Wow, some young people are really fit! Great End and Allen Crags from Langdale (18.0km and 1017m of ascent). Start/end: Old Dungeon Ghyll car park. After a good break, I headed to Esk Hause and thought about popping up to Allen Crags, but I was feeling fine so decided to continue to Great End and planned to pick up Allen Crags on my return. The route from Esk Hause through Calf Cove is pretty busy, it’s one of the main routes to Scafell Pike, so all of a sudden, there were lots of people. It didn’t last long. Once I turned right at the top of Calf Cove, people disappeared and I had the place to myself again. 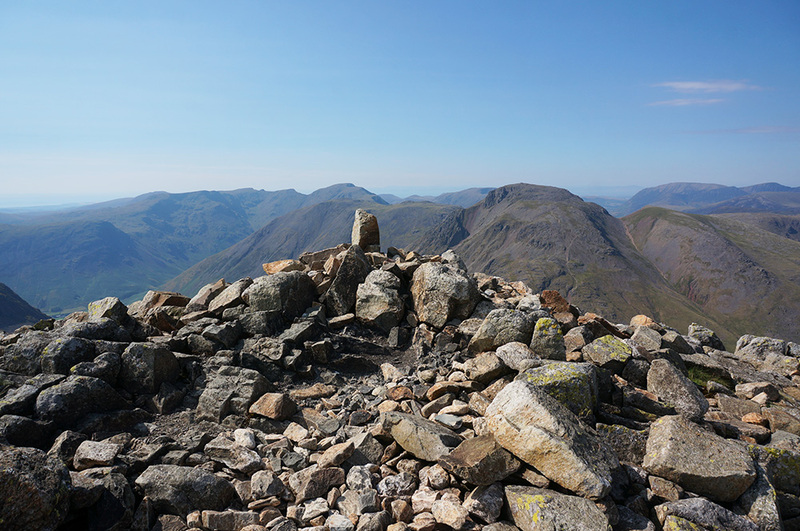 The west top at Great End, looking north-west to Great Gable. The top of Great End is really rather beautiful, a wide, stony plateau with two (or possibly three) summits. Neither Wainwright nor Mark Richards are willing to suggest which is the higher, preferring to state a preference based on aspect. The Ordnance Survey are less equivocal, giving the honours to the south-east cairn, which I personally preferred. Although the view from the north-west top was excellent, with views to Scafell Pike and Great Gable, the view from the south-east top was (in my opinion) even better. There’s a wonderful view all along the ridge route I’d taken the previous day, from Pike o’Blisco all the way to Esk Hause and Rossett Pike. I didn’t worry too much about which was the actual top, I visited them both, the weather was perfect and the feeling was sublime. 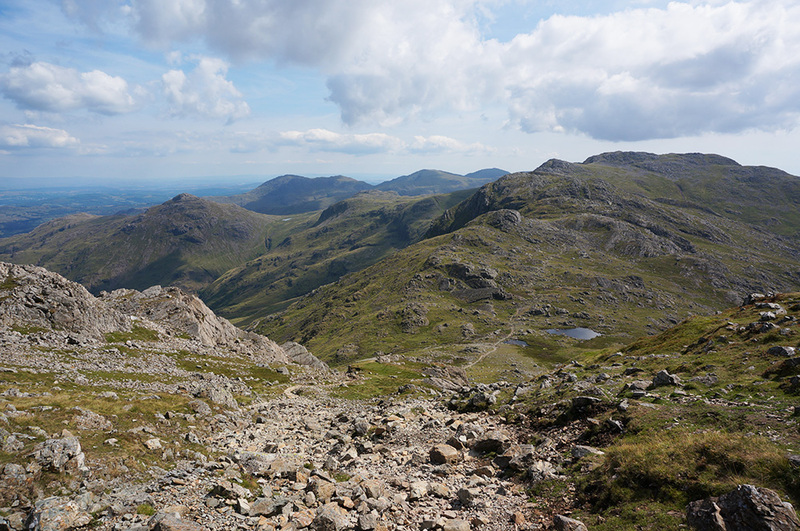 View from the east top at Great End, looking south-east to Esk Pike, Bowfell and Crinkle Crags. Sometimes, I reach the summit of a fell and the place is so devastatingly beautiful that I feel like I want to stay forever. This was one of those occasions. I had this precious place all to myself and I remained there for well over half an hour, totally immersed in the genius loci. Eventually one has to admit to oneself that time moves on, shadows lengthen and this place must change. I know from experience that on another day in different weather, this could be a really tough place to be. I was grateful that, on this occasion, I was able to visit a mountain top at its very best. Reluctantly, I retraced my steps across the plateau and down Calf Cove back to Esk Hause. I was now glad I’d saved Allen Crags for the return and had the opportunity to extend the sense of wonder. 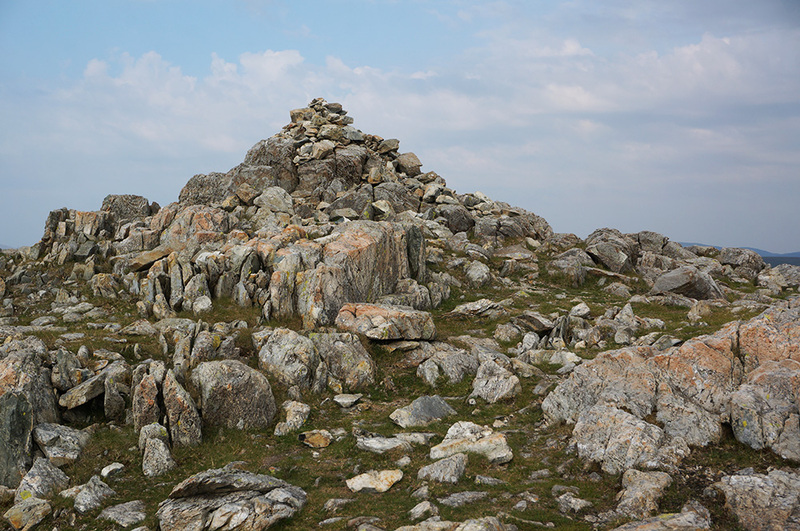 The lovely summit cairn at Allen Crags sitting atop a pink and grey rock platform. A short, steep pull up from Esk Hause and I was at the summit of Allen Crags. 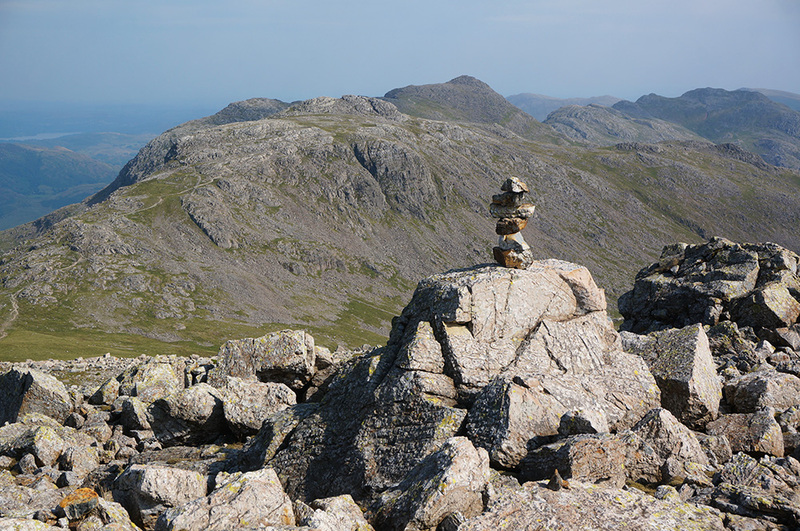 A neat cairn atop a rock platform and another marvellous panorama mark the top. 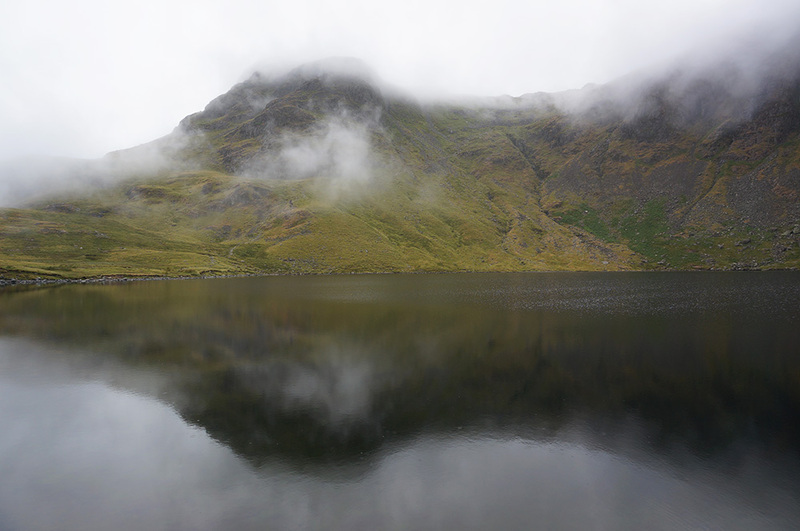 I dallied only a short while as it was now 5pm and made my way back down to Esk Hause and then to Angle Tarn. I made it back to the car feeling in much better shape than I had the previous day. By now, I’ve become used to my level of fitness. No doubt I could be fitter if I was walking the hills every weekend but these intermittent visits mean that four day-walks on the trot is as much as I can comfortably do without a rest day. So Friday was to be a rest day. However, I still felt like walking because the weather was beautiful again. 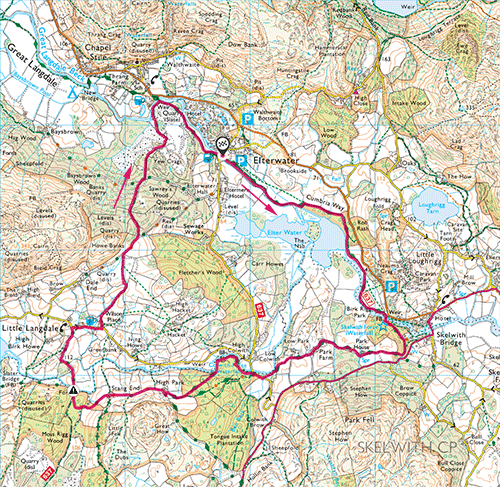 Elterwater Round (9.8km and 445m of ascent). Start/end: Elterwater car park. Fortunately, I’d planned a couple of low-level walks just in case Remco found the fellwalking too tough. To his credit, they weren’t needed so I thought I’d try one out. The Elterwater Round started and ended at the hostel, so no driving required and at just 10km, I could amble along at a relaxed pace. It turned out to be a real treat of a walk. Nice and easy with great views to the Langdale Pikes and through an assortment of landscapes from road to field to woodland and waterside. It reminded me very much of the kind of family holidays we’d had when I was a kid (Mum was never a keen fellwalker but loved a gentle stroll through beautiful countryside). 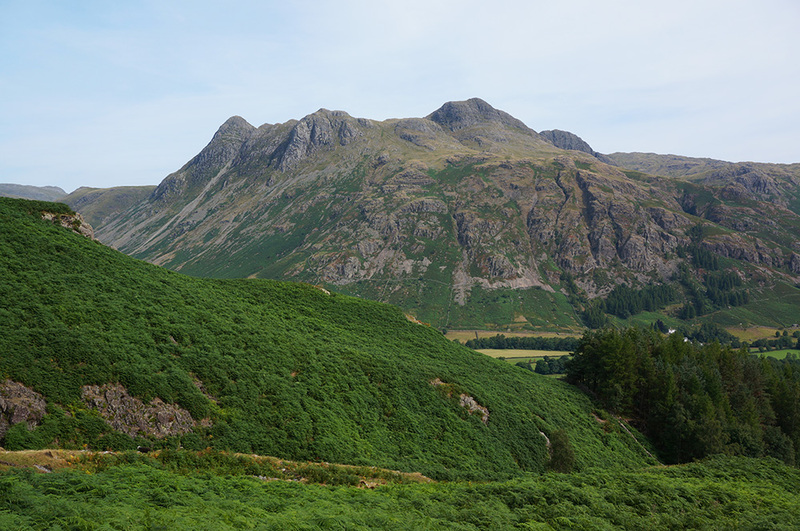 The Langdale Pikes with Harrison Stickle, centre from the quarry at Elterwater. Towards the end of the walk, the footpath passes through the compound of a working slate quarry and, this being a working day, there was plenty of activity. As I exited the compound, a guy in a high-viz vest gave the all-clear and a siren started winding up. Shortly after that there was a low-frequency boom and the sound of slate falling from the quarry face. On returning to Elterwater, I rewarded myself with an ice-cream, which topped-off that nostalgic holiday feeling. Saturday would be my last walking day for this trip and I would be driving back to Southport that evening. Also, the weather had turned. Yesterday had been stunning but when I drew back the curtains this morning, the hills were shrouded in mist and it was raining. Under the circumstances, I thought a relatively modest walk might be in order. I decided to head for Seathwaite Fell from one of my favourite starting points at the National Trust car park as Seatoller. It doesn’t seem to matter what time of the day or what time of the year I visit, there is always a parking space. There is a certain appropriateness about bagging Seathwaite Fell on a rainy day. 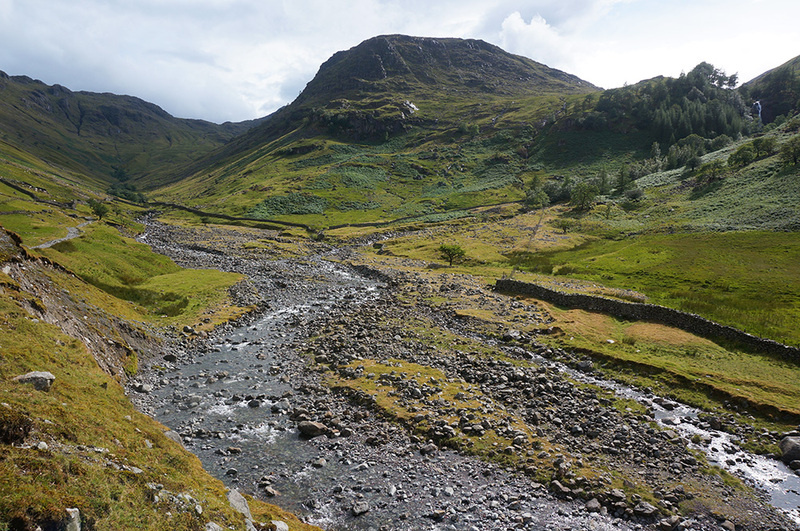 For many years, Seathwaite was though to be the wettest place in the UK although recent studies suggest otherwise. Nonetheless, it’s still considered to be one of the wettest so today seemed to be a good day to bag it. 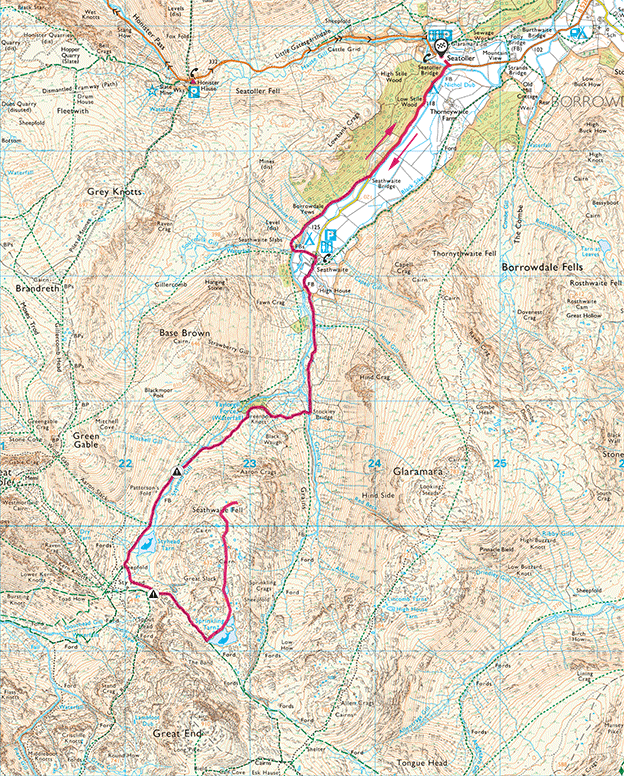 Seathwaite Fell from Seatoller (16.4km and 699m of ascent). Start/end: Seatoller car park. By the time I arrived at Seatoller, the rain had stopped and I thought I might not be getting wet. 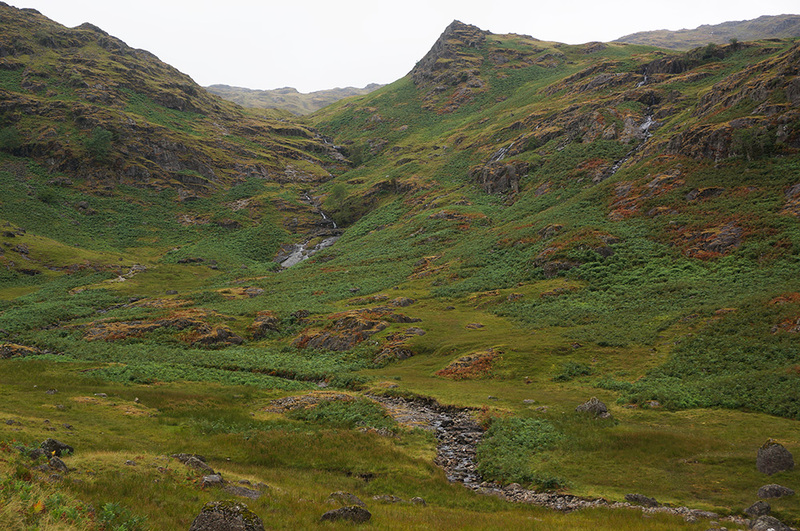 I walked the couple of kilometres to Seathwaite and just as I got to the footbridge, the rain returned. I pulled out my waterproof over-trousers and jacket and put them on, knowing that I was very likely to be wearing them the whole day. I set off on the bridleway to Stockley Bridge and, this being a Saturday in July, there were other walkers about, all of them in waterproofs with hoods pulled down. From Stockley Bridge there’s a steep pull up on the path to Styhead Tarn and around the flank of Seathwaite Fell. Once the steepest part is won, the ground levels out and the path follows Styhead Gill which, despite the recent dry weather, was flowing generously. There is supposed to be a direct route to the summit from this part of the route but no matter how hard I looked I couldn’t see anything looking remotely like a safe route to the fell top. So I decided to continue up to Styhead and approach the summit from the rear. As I continued towards the tarn, the wind got up and made walking a little more difficult. At the tarn I met a very jolly older chap, who exclaimed as he walked towards me, “Thank goodness we’ve got some proper weather, all that sunshine is no good for real walking!”. I agreed with him, happy to be in the wind and rain. Great End from Styhead Tarn on the return from Seathwaite Fell. 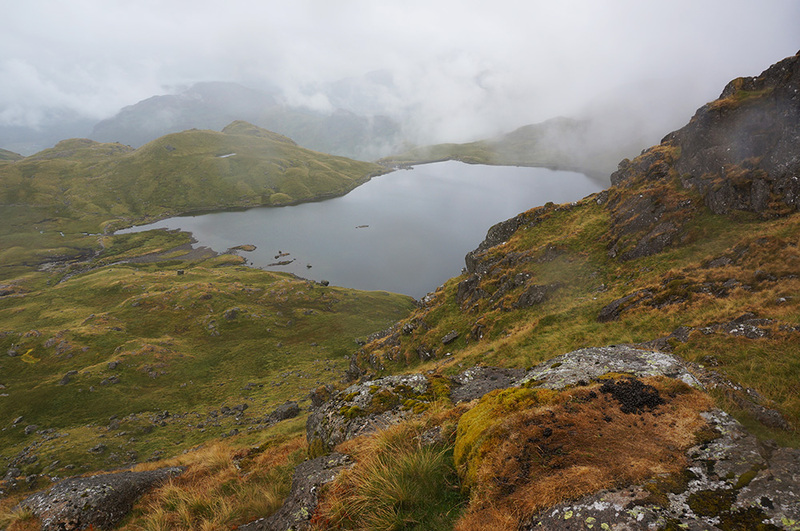 At Styhead I turned left towards Sprinkling Tarn as the wind strengthened and the mist lowered. I was really hoping the mist wasn’t about to come right down and spoil the day. Suddenly, out of the gloom ahead, a small group of people were running towards me, leaping down over boulders as I struggled up and against a buffeting wind and the driving rain. As they got closer I realised they were Mountain Rescue. I hoped they were just on a practice although I had seen plenty of people today, any one of them could have fallen and injured themselves. 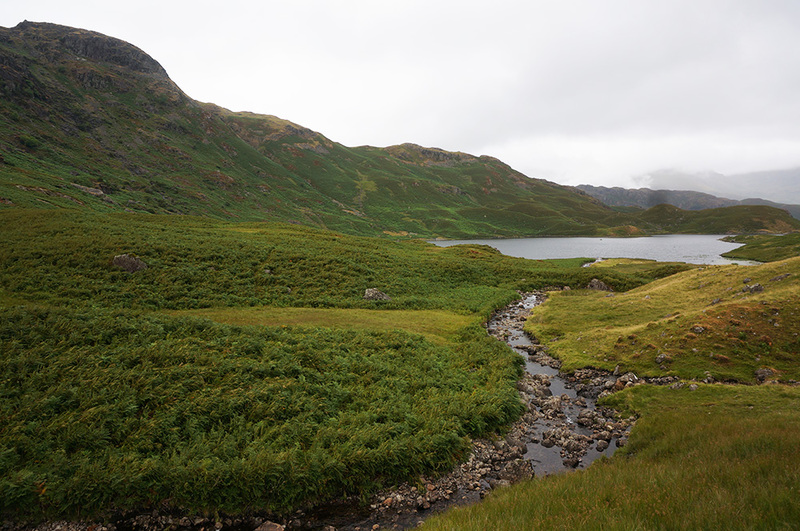 The bridleway up to Sprinkling Tarn follows a small stream with a number of small cascades. At one of these, the wind was so strong that the cascading water was being blown back upstream and I started to wonder whether it was sensible to continue. Sprinkling Tarn is a beautiful place and today the surface of the water was animated as the wind scudded over the surface, darting here and there. I took a short break there and as I did, the wind began to drop a little. A misty Seathwaite from the accepted summit of Seathwaite Fell. There is no obvious path from the bridleway across to Seathwaite Fell but I had a general idea of the direction. I followed the north-western shore of the tarn and a few faint paths began to emerge. Seathwaite is one of those fells where the accepted summit is not the highest point. In this case, it’s the most forward high point with the best view. Fortunately, on this occasion, I’d done my homework so I was fairly confident when a group of younger (and faster) walkers asked me if I knew where the summit was. As I neared the summit, the wind continued to drop and the rain eased a little. However, it was still raining softly when I arrived and I liked the idea of being at the wettest fell on the wettest day of my trip, it just seemed fitting. I found a sheltered spot near the summit and took a break. 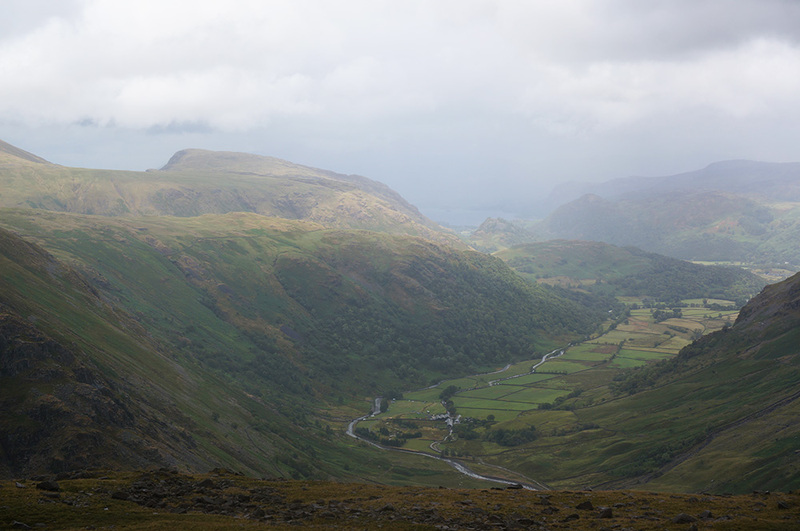 The view down into Borrowdale is impressive and the quickly-rolling cloud-base sent pools of light and shade chasing over the valley below. I thought for a few moments about trying to find the direct route back but I’d enjoyed the landscape I’d come through and there was no time pressure, so I decided to return along the same route. 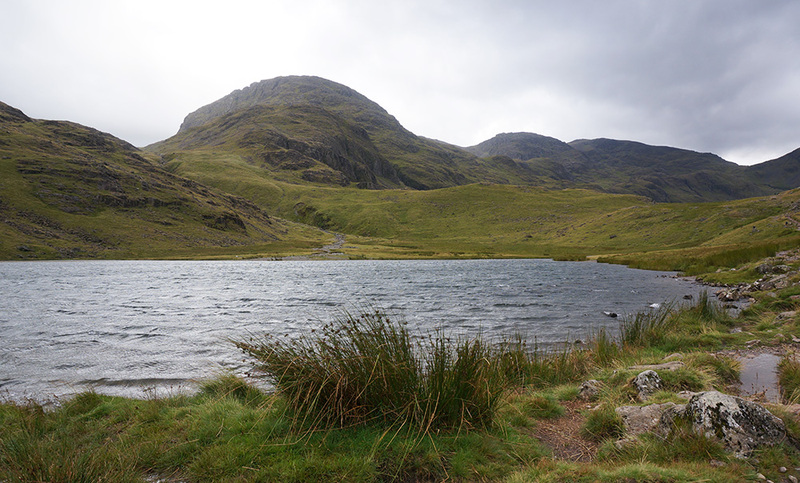 The two tarns were definitely worth a second visit and the sky was starting to brighten. It always seems longer on the return leg of any walk but in this case I didn’t mind. In truth, I was spinning out my time in the mountains as much as I could. Seathwaite Fell from the bridleway below Stockley Bridge. My Wainwright total now stands at 178, which is a good total but geographically, the remaining tops are a little messy, with Glaramara and Rosthwaite Fell now being outliers. Fortunately I should have a good opportunity to tidy things up during my August visit, which is likely to be my last of the season. As time has gone on, I’ve needed less and less new kit but one item that I’ve often thought would be useful is a portable seat pad. I did actually have a Multimat when I started this adventure but I left it somewhere on the fells on one of my early walks. I never replaced it because it didn’t easily fit in my rucksack. I recently came across the Therm-a-Rest Lite Seat and although relatively expensive at £23, I thought I’d give it a go. I’m really glad I did. This little marvel rolls up to slightly less than the size of a can of fizzy drink and is extraordinarily comfortable. It’s ideal for those lunchtime breaks, providing both insulation and a soft perch on even the coldest, hardest of boulders. Performance is really excellent and the Lite Seat now forms part of my permanent walking kit.